Non-invasive pain management and electro-medicine are rapidly growing fields; with many billions of dollars spent annually for these procedures. 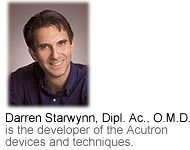 The Acutron Mentor is not just a microcurrent device. 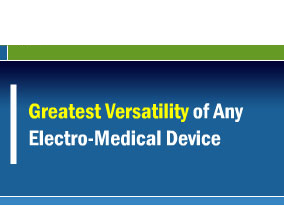 It's approved by the FDA and packaged with solutions including 19 built in treatment protocols, easy to use controls, microcurrent and milliamp capable, one-on-one training, and sales & marketing guidelines. It's a success system! (1) Do you need to augment your income through increased new patient referrals? (2) Would you like to have a clinical tool that will "never be old" technology? (3) Are you frustrated with hard-to-treat patient pain issues? (4) When you have questions, don't you want immediate answers? (5) Would you like a device that has flexibility and will grow with your knowledge and capabilities? If the answer to any of these questions is yes, please call the Eastwestmed sales department at 1-800-872-6789 to schedule a complimentary business evaluation and briefing session for the individual needs of your practice. Please continue on with the tour. 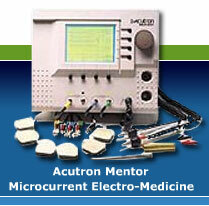 The Acutron Mentor is a highly versatile electro medical device offering a wide range of valuable treatment modalities. It has four independent and isolated output treatment channels, which facilitate treatment of multiple treatment sites or multiple patients at the same time. It's like getting five separate devices in one, easy-to-use integrated package. 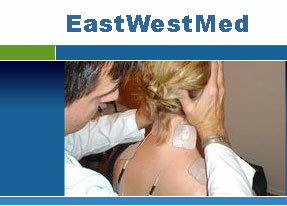 It offers the widest range of microcurrent therapies of any available device. Treatment currents are delivered through probes for specific point stimulation for trigger points, acu-points, and pad electrodes for single channel and interferential treatment styles. The Acutron also offers high-intensity milliamp currents for acute pain control and analgesia, including classic interferential and Russian stimulation. The Acutron Mentor includes conductivity test meters on each output channels which can be used to confirm optimal electrical interface with the patient's body, as well as reading out changes in conductivity in stimulated sites.